The chances are almost 100% that everyone reading this has some way to access the Google Assistant. You might even have more than one Assistant device now that most phone released in the last few years have support and Google is handing out Home Minis like they’re going to expire. 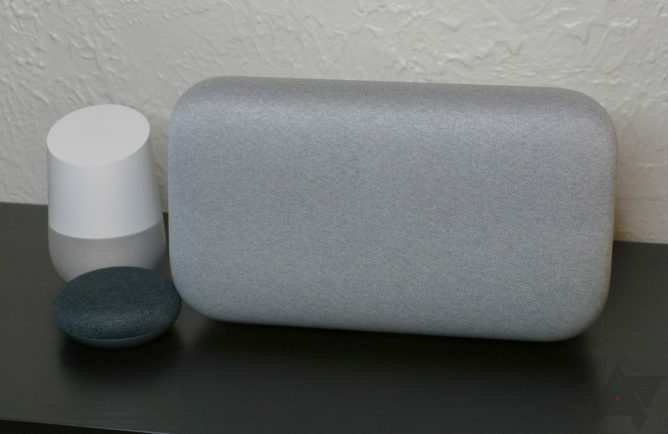 The original Google Home has a respectable speaker for the size, and many people use it to listen to music. Yet, for anyone who’s serious about their tunes, the Home and Home Mini just don’t cut it. That’s where the Home Max comes in. This smart speaker is not screwing around—it’s big, heavy, and incredibly loud. The Home Max is an expensive speaker, and it’s not alone in that respect—you can spend a lot on speakers of all shapes and sizes. However, Home Max could be a great option if you care deeply about audio quality and want easy Assistant integration. The Home Max is smartly designed, feature-rich, and sounds excellent, but most consumers will find it tough to justify that $400 price tag. Setup Home Max setup only takes a few minutes, and you’re ready to rock. Audio Very clear, loud playback with big bass and highs. Google’s EQ is pleasing to my ears. The AUX port is a nice touch if you have other devices to plug in. Design It’s big and heavy, but the fabric makes it look inviting and understated. Has a compact power plug. Voice Does all the Assistant things and is very good at detecting OK Google commands even with music blasting. Touch controls The touch bar is a bit clunky. Price At $400, this seems like a Google vanity project. Like other smart speakers in the Home lineup, the Google Home Max is not designed to attract attention in spite of its large size (it weighs 12 pounds). It comes in either white/gray or black colors with a fabric sheath covering the front portion where the speakers live. The traditional quartet of Assistant LEDs shine through the center of the fabric when you interact with the speaker by voice or change the volume. Behind the fabric cover are a pair of 114mm subwoofers, two 18mm tweeters, and six Class-D amplifiers. Five microphones are spread across the surface of the Home Max as well. Around back is the power port, a USB Type-C, and AUX in. The inclusion of AUX is a nice touch if you want to pipe in audio from a non-smart piece of audio equipment. I also love that the wall end of the plug is so compact. 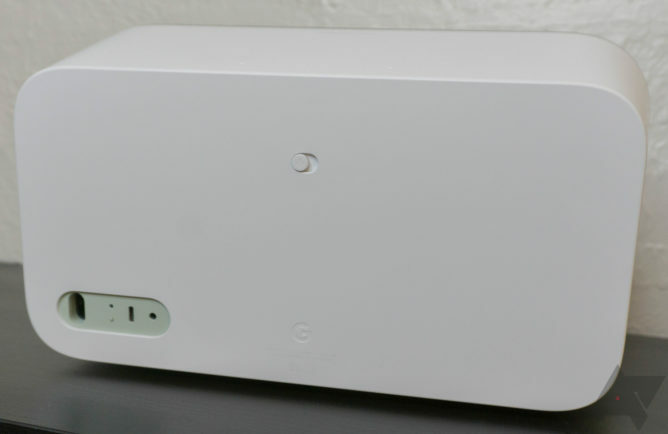 The regular Google Home has a giant plug because it contains the power circuitry, but that’s all inside the Home Max. 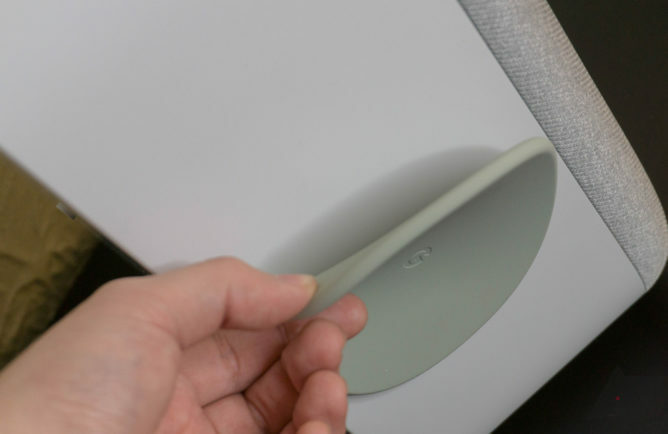 There is also a physical mute switch on the rear of the Max, which is similar to the switch on the Home Mini. Google says it’s moved to using a switch instead of the button so people can always be assured of mute status at a glance. The fabric section of the Max is the widest part. The plastic cabinet tapers down slightly, ending in a flat back. On the top surface is a touch-sensitive region allowing you to play/pause music and change the volume. Oddly, this area is denoted only by a small gray bar in the middle of the device, but the touch sensor extends almost all the way to the edge. There’s a sticker on the device when you get it that indicates the tap region in the center (play/pause) and volume control (sliding left and right). I didn’t realize this was a sticker at first. 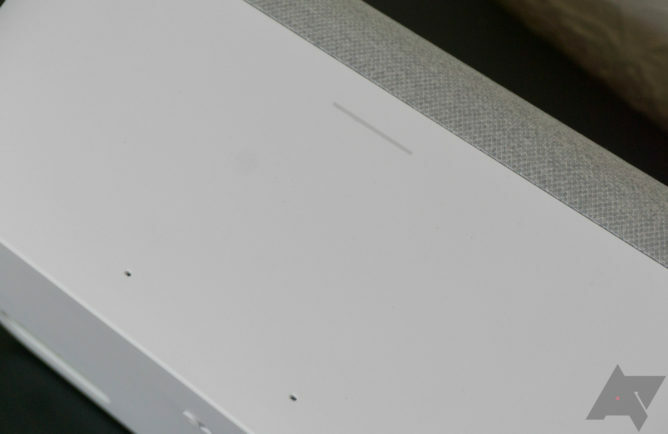 I wish Google did a bit more with this sensor bar—maybe let us skip tracks? You can’t even long-press to call up Assistant. I’d be fine with a few more controls printed on the housing in the name of improved functionality. The Home Max comes with a base mounted to the bottom of the speaker, but that’s not necessarilythe bottom. The Max works in “landscape” or “portrait” mode, so you can peel the rubbery base off the bottom and affix it to the right side. When you prop the speaker up that way, an internal orientation sensor recognizes that and switches to mono playback (like most phones with dual speakers). You’ve probably noticed something quite unusual about the Google Home Max—it’s not an omnidirectional device like most other smart speakers. 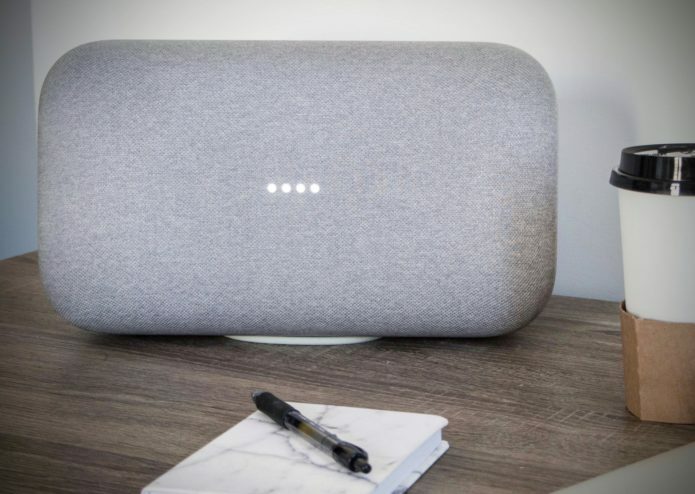 Google designed this device from the ground up with audio quality in mind, and that meant dispensing with the myth that people are going to place a speaker in the middle of the room. Not only are most speakers a little too gadgety to work as the centerpiece of your decor, but you also need to plug them in, and that’s not convenient on your coffee table. Most people put speakers on a shelf or table near a wall, and Google Home Max is prepared for that. The five microphones I mentioned earlier aren’t only for listening to your voice. They are also the key to Google’s Smart Sound feature. The Home Max listens to its own sound output in order to model acoustics in the room. According to Google, placing a speaker near a wall (as most of us do) can increase the bass response and muddy the overall sound. The Home Max identifies the acoustic properties of the room based on its location almost immediately and adjusts sound output over the course of about 30 seconds. So, if you move it, the output will gradually change until it’s once again true to the intended sound. The touch bar indicator and two mics. That’s what Google says will happen. I moved the Home Max around a few times, and I didn’t notice a difference in sound quality. I suppose that means Smart Sound is working? What I can say is the Home Max sounds fabulous. At lower volume levels the Max has big bass and highs, and the mids are pulled back just a touch. This is the custom EQ setting from Google (this isn’t a reference monitor, so don’t expect a flat EQ). The Home app includes a slider for bass and treble, and that’s all. The Max really shines when you crank the volume to around 50%. The bass pumps, but you don’t lose clarity across the rest of the spectrum. When you push the Max past 50% volume, it gets almost unbelievably bassy. Very few speakers I’ve heard can hit the bass so hard without distorting the music, but the Max still sounds crisp and extremely good. 75% volume is about as loud as I can reasonably go. My office isn’t big enough to contain more sound, and you can hear the music clearly throughout the house at that volume. The few times I pushed it a bit more in the name of science, I could detect some slight, almost not-worth-mentioning distortion. In a larger space, you could probably crank it all the way up and still have a good experience. You’d probably have to buy some very expensive, complicated enthusiast audio hardware to do any better. LEDs light up behind the fabric to indicate the speaker is listening. The Max also works in pairs, which you set up via the Home app. This is when you’d rotate the speaker to stand up and play in mono mode. Then one speaker gets the left channel, and the other gets the right. I can only imagine how loud they are in true stereo. For $800, I should hope the answer is “really” loud. The Google Home Max is the best-sounding smart speaker you can purchase right now. 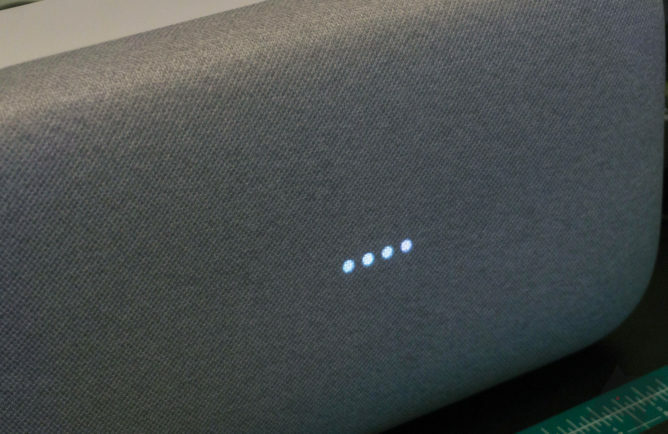 It has all the same Assistant capabilities as the smaller members of the Home family, but the audio quality is fantastic. Tracks sound crisp, and the bass is powerful without being overbearing. I love listening to music on this device, and it won’t miss Assistant commands even with the volume cranked up. It’s remarkably minimalist for being so gigantic, but the touch bar controls are a bit clunky. The “Chalk” colored speaker will probably fit most decor better than the “Charcoal” version. In either case, the fabric cover gives the speaker a cozy vibe. Does a $400 smart speaker make sense for most people? Probably not. Although, Apple is going to try and sell the HomePod for only $50 less. In that context, the Home Max seems like a real bargain. You could probably get a more flexible sound system for a similar price with some high-end bookshelf speakers and a Chromecast Audio, but it’s nice having everything ready out of the box with the Home Max. This seems like a vanity project for Google, but it’s a good one.